Music and cask ales make for a popular event and these elements will combine for a great bank holiday at Crich Tramway Village. The Beer and Bands event will be rolled out on May 6 and 7. Confirmed bands include Belper Town Wind Band and Newmount Brass playing in the bandstand on Sunday, with Silver Sax and Sideways Music in the learning centre. 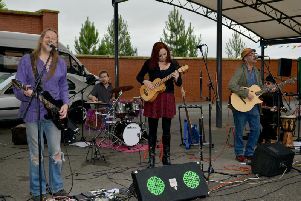 The Red Lion pub will host Stunt Double with their mix of popular music followed by Sensible Shoes and folk group Box O’ Frogs. Stunt Double consists of Jon Alex, a professional club and corporate entertainer for over 20 years, and Chris Firminger. Chris plays guitar in several bands including Firecracker, Dave Berry, Frank White, Julian Jones and Adrian Paris and his own Chris Firminger band. Chris has also recorded many backing songs for TV programme Pop Idol and has played guitar on the hit single ‘Walk like a Panther’ for Tony Christie and Jarvis Cocker. On Monday, New Mills Band and Crich Brass will occupy the bandstand, while Herding Catz and Hag Farm Conspiracy will be in the learning centre and Andy Martin and friends returns to play the Red Lion pub. The Red Lion serves local cask ales, wines, ciders and bottled beers, while Rita’s Tearooms offers cakes including red velvet, carrot, carrot and walnut, Victoria sponge and Bakewell puddings and locally sourced pies. Catering manager Alison Isaacs said: “Wherever possible we use local food and drink suppliers, and this event highlights this fact.